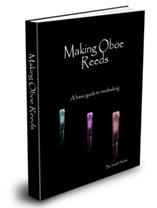 How Do Your Reeds Actually Work? Reed testing is a very important aspect of reed making. The most important thing a reed can do is to function properly. That means in part the notes sound when you want them to, not when the reed wants them to. As important as a good sounding reed is, there are other more important things to look at. The following exercises will help you see if your reed does these three things. In this next example, look for a clean and clear articulation on each note. Everything must be clean at different dynamics. The notes should speak evenly throughout all the registers. In the following example, start soft with no accent on the first note. Do not accent the top note either. It should sound like the word “finish”. Try these reed testing exercises. They are much harder than they look. Remember to let the reed vibrate. Don’t help it sound better. Really see what the reed is doing.